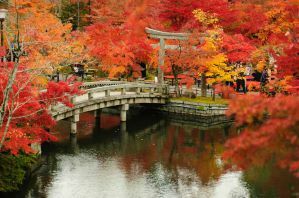 Japan is a fascinating and fun country to visit with a unique culture, beautiful landscape, and delicious cuisine. It's also an expensive place to visit. If you're hoping to save some money, there are a variety of good hostel options throughout. Hostels in Japan are diverse, and range from reliable hostel chains to independently owned facilities with traditional styles. If you're looking for a comfortable and social place to stay in Japan, that won't break the bank, then a hostel is likely your best option. How much do hostels in Japan cost? An affordable and comfortable hostel for backpackers, students, and groups in Tokyo, Japan. Khaosan Tokyo Kabuki is a popular hostel in Tokyo with all types of budget travelers. Whether you're traveling alone, with friends, as a couple, or even as a family, this hostel offers an affordable and reliable option in a nice part of the city. It's conveniently located near Kaminarimon, Asakusa Temple, and Asakusa Station. The rooms are kept clean and comfortable and each room has its own air conditioning. There are also the standard amenities available including free internet access, laundry facilities, an elevator, and luggage storage. The hostel has dorms that sleep up to four people and every guest that is staying in a dorm is given access to a security locker. There are also twin and four bed private rooms available if you want a little more personal space. An affordable hostel for students, female travellers, and backpackers in Kyoto, Japan. Okis Inn is a charming hostel with a lot of character. It's run by a friendly couple who keeps the atmosphere relaxed and respectful. The hostel is located in a traditional Kyoto style house that is about 100 years old. If you're looking for a traditional experience that is still affordable, then Okis Inn is a great option. The hostel is also in a good location near many good restaurants, cafes, a supermarket, and a convenience store. There's also a small Japanese style Tatami common room and a small and basic kitchen. The dorms sleep up to four people and there are twin private rooms available. An affordable hostel for students, backpackers, and small groups of travellers in Osaka, Japan. Tani9 Backpackers Osaka is a favorite hostel for budget travelers and backpackers to the city of Osaka. It has a lovely atmosphere where it's easy to meet other guests. There's a nice lounge area where you can hang out and chat and the hostel is located in a small home that gives it a charming feel. It's also conveniently located near Metro Tanimachi LINE Tanimachi9cho-me station. You can walk to the Osaka castle and Namba area. There are both private rooms and dorms available. Dorms sleep up to eight people and there are several private room options to choose from. If you're looking for a quintessential backpacker experience at an affordable price, then Tani9 Backpackers is a favorite option. A fun hostel for students, backpackers, and small groups of friends in Hiroshima, Japan. K's House Hiroshima is a friendly place to stay with a welcoming staff. The hostel is in a good location for visiting the Peace Park and Miyajima. It's located about halfway between the JR Hiroshima Station and the downtown and there's a tram stop nearby. There are a variety of amenities available here including a full kitchen, laundry facilities, free wi-fi, a book exchange, bicycle rental, a roof top terrace, and free luggage storage. 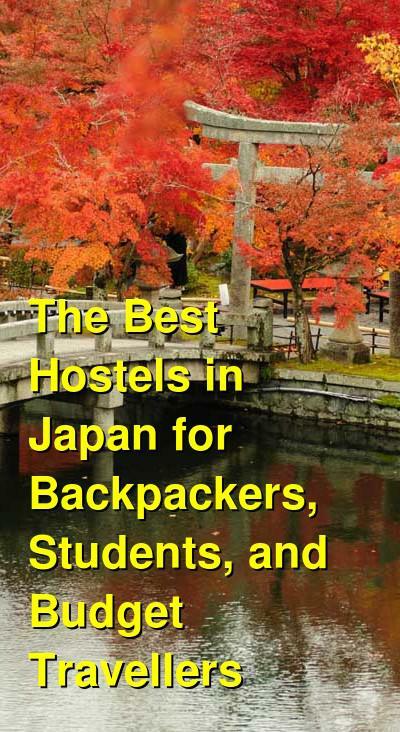 The hostel is part of a chain of hostels found throughout Japan and it has a reliable reputation and affordable prices. A good hostel for independent travellers, students, and families in Sapporo, Japan. Khaosan Sapporo Family Hostel is a reliable and popular hostel in Sapporo. It's conveniently located less than a ten minute walk from Odori Park and it's ten minutes from a metro station. It's also two kilometers from the Sapporo Clock Tower. The hostel has a variety of amenities for guests including a shared kitchen, public computers and even a kids play area. There are basic dorms available that have bunk beds and shared bathrooms. Each dorm sleeps four people and female only rooms are available. Private rooms have tatami floors and futons and sleep between two and four people. An affordable hostel for backpackers and solo travellers in Fukuoka City, Japan. Kia Ora Budgetstay is an affordable and convenient place to stay for a night or two in Fukuoka City. It's conveniently located about ten minutes from Hakata Station Chikushi Exit, which offers access to many places in the city. The hostel has all of the standard amenities for guests including air conditioning, free wi-fi, and an elevator. There's a pleasant lounge area on the first floor and public computers which guests can use. There are six and ten bed dorms available (both female only and co-ed) as well as twin, three bed, and four bed private rooms. An affordable hostel for backpackers, hikers, students, and solo travellers near Mt Fuji, Japan. K's House Mt Fuji is part of the K's House hostel chain. This particular hostel is located in Kawaguchiko town, which is a popular base for exploring the Mt Fuji area. It's walking distance from Kawaguchiko Station, although it's kind of a far walk. It's also just a couple of minutes from Ogi bus stop and three minutes from Lake Kawaguchiko. The hostel also organizes tours of Mt. Fuji's five lakes. This makes an easy and convenient way to explore the area. If you're hoping to climb the mountain, the hostel is a bus ride away from Mt Fuji's 5th Station. The hostel is clean and comfortable, and it offers both private rooms and dorms. There's a shared kitchen where guests can prepare meals, a television room with free dvds, and a lounge where you can relax with other guests. There's also laundry facilities and internet access available. An affordable hostel for backpackers, students, and small groups in Nara, Japan. Naramachi Hostel and Restaurant is both a hostel and restaurant in Nara. It's located in an old soy sauce factory and it has a rustic charm that keeps with the ambiance of the area. There are a variety of different room types within the hostel including singles, doubles, and group rooms. There are dorms that sleep either four or six people and female only rooms are available. An affordable hostel for backpackers, students, and female travellers in Nagoya, Japan. Glocal Nagoya Backpackers Hostel is a short walk from Nagoya Station and just steps from the Willer Express bus stop. It's surrounded by a variety of restaurants and bars and there's a convenience store nearby. The hostel is a fun and relaxed place to stay. There's a cafe and bar on the first floor and the guest rooms are split between the 2nd, 3rd, and 4th floors. One of the floors is female only and there are a variety of dorm options to choose from that sleep between four and eight people. There are also two private rooms available that each sleep four people on two bunk beds. The hostel has several good amenities available including a shared kitchen for guests, laundry facilities, and all kinds of travel information. This is a nice place to spend a few nights in Nagoya. An affordable hostel for backpackers, students, solo travellers, and families in Kanazawa, Japan. Khaosan Kanazawa Family Hostel is a good option for visitors to Kanazawa. Although it's a bit removed from the main attractions, it offers a fun and friendly atmosphere that appeals to all types of travelers, from independent travelers to families. The staff here are knowledgeable and welcoming. There are rooms where guests can hang out and get to know each other. There's also a full kitchen where you can cook your own meals. This is a nice perk as eating out can become expensive. There are both dorms and private rooms available. Co-ed and female only rooms are both available and sleep up to eight people. There are a wide variety of private room options including singles, twins, doubles, and small group rooms. An affordable, quiet, and safe hostel for backpackers and solo travellers in Takayama, Japan. Quality Hostel K's House Takayama is part of the K's House hostel chain, of which there are two in Takayama. The hostel is located just a short walk from JR Takayama Station and it's kept clean and comfortable for guests. There are several common areas where guests can hang out including a common lounge and dining area and a shared kitchen. There are laundry facilities available, free wifi, and bicycle rental. The hostel has a wide variety of private rooms available as well as four bed dorms. An affordable hostel for backpackers, solo travellers, and small groups of friends in Hakone, Japan. Another hostel of the K's House chain, K's House Hakone is in a popular area for hot springs. The area attracts both local and international visitors who come to experience the onsen hot spring resorts. K's House Hakone is about a kilometer away from Hakone-yumoto station and is a popular option for budget travelers to the area. There's a communal natural onsen that has an open air bath for guests. There are also dorms that sleep between four and eight people as well as private rooms that range in size from twins to six bed group rooms. A relaxing hostel for backpackers, solo travellers, and female travellers in Nikko, Japan. Space Riverhouse Hostel is a nice place to stay near Nikko, Japan. Although it's a bit outside of town, there's a shuttle service that makes getting around convenient. The hostel also has a kitchen and restaurant area where you can enjoy dinner and a free western style breakfast every morning. This is a wonderful place to hang out and meet other guests. There's a great open air lounge area next to the river. It's a peaceful and natural setting where you can soak up the atmosphere. The hostel also has bikes for rent, swimming tubes, snorkels, and goggles. If you're hoping for a unique and fun experience, then Space Riverhouse Hostel is a good option.